Celestial objects vary greatly in size, chemistry, and dynamics. 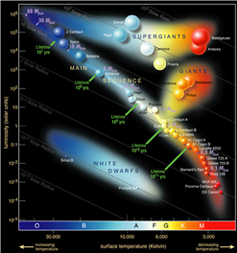 Astronomers have developed a way to plot stars which relies on their intrinsic brightness and surface temperature (or color temperature) – referred to as the Hertzsprung-Russell diagram. Because stars can vary their appearance over their lifetimes, which are much longer than a normal human lifetime, it is helpful to bring as many tools to our studies as we have. Different wavelengths, different time scales, high-resolution imagery and spectroscopy all help us puzzle out what is happening with the objects we study. Typically, astronomical instruments specialize in monitoring specific wavelengths of light and then use another technique, such as high-resolution imagery, to answer important questions about the objects they study. 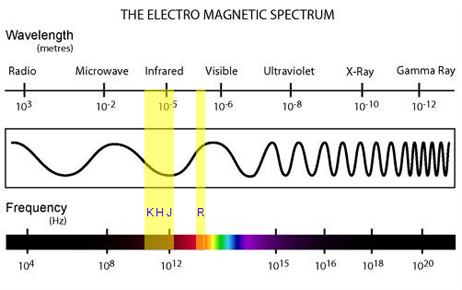 The MROI will be able to observe objects that radiate in the optical R (Red) band (R = 0.64 μm) and into the near infrared J, H, and K bands (J = 1.25 μm, H = 1.65 μm, and K = 2.20 μm). 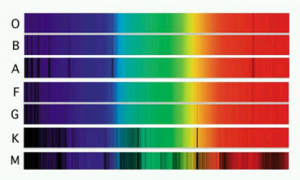 These wavelengths were chosen because many important astrophysical processes associated with spectroscopic line emission and hot dust are brightest at these wavelengths. 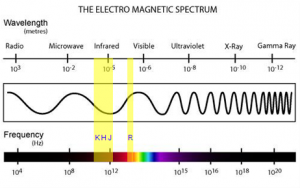 The diagram of the electromagnetic (EM) spectrum below shows approximately where these wavelength bands lie with relation to the other parts of the spectrum. Stars will be one of the main categories of objects the MROI will observe. Stars are key to the evolution of the universe and create all the elements in the periodic table after hydrogen and helium. They are not strictly round and yellow, like the Sun, but exist in many different sizes and shapes and temperatures. 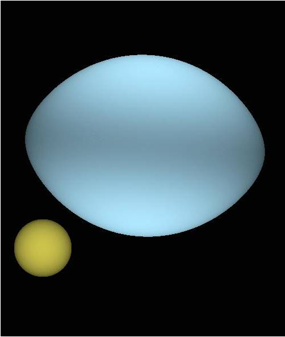 An excellent illustration of this is seen in the image below: a comparison of size and shape between Regulus (a blue supergiant) and our sun (a yellow dwarf); note the immense size difference and oblong shape of Regulus. The oblong shape is due to the star’s very rapid rotation rate. The rapid rotation deforms the star similar to how a water balloon would deform under rotation. An artist’s rendition of the Sun (yellow) and Regulus (blue) based on observations taken with the CHARA interferometric array. Some stars lose mass during their evolution as well. Below is an artist’s rendition of the Be star Alpha Arae, under rapid rotation. 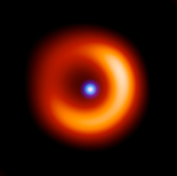 Note the outflow of material along the axis of rotation (the poles), as well as the dust torus across the disk of the star. Brown dwarf (failed stars) stars and Cepheid variable (pulsating) stars are also likely candidates for observation – both having some fundamental astrophysics associated with the stage of evolution they are in. An artist’s rendition of Alpha Arae based on observations taken using the AMBER instrument at the VLTI array. Although brown dwarfs are small in comparison to our sun, only a few times the size of Jupiter, there are a few within reach of the MROI. Measurements of their diameters would allow astronomers to gather information in order to help discern between different theories about how brown dwarfs evolve and support themselves against gravitational collapse. Cepheids are astrophysical standard candles, stars which show a relationship between their intrinsic brightness and the period of the variation of their light output (due to actual pulsation of the star). Cepheids are important in order to understand the distance scale of the universe which is based on our theoretical understanding of the relationship between their pulsational period and brightness. The MROI can help to determine, independently, if all Cepheids behave the same way. A protostar is the term for a star before it becomes a star. 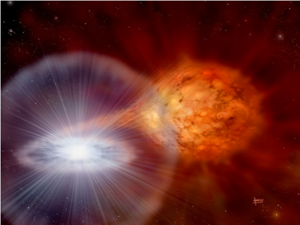 The cartoon below shows how a protostar begins as an immense cloud of gas which becomes gravitationally unstable (a) and starts to collapse under its own gravity. The increase in pressure generates heat and pushes back against the gravitational collapse (b). If the cloud’s gravity is strong enough it will make the cloud generate so much heat under the pressure that hydrogen fusion is possible (c). The point at which the protostar begins its “hydrogen burning” is the point at which it becomes a star known as a young stellar object. 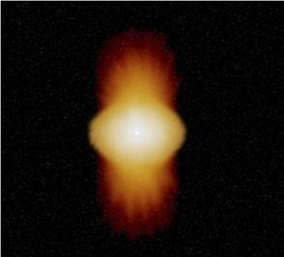 An artist’s rendition of the steps in the formation of a star. An actual image of a YSO – LkHalpha 105 – taken using the IOTA interferometer and aperture masking on the Keck Telescope (Tuthill & Monnier). The inclined dust disk around the central protostar is clearly evident in red. The structure and dynamics of these YSOs are important factors in understanding stellar birth and evolution and the formation of planets. As the gas and dust collapses into a rotating disk, instabilities will allow the formation of small condensations which may eventually become planets. Astronomers believe that the planet formation process happens essentially simultaneously with the formation of the star itself – being both rapid and likely very efficient. The MROI will be able to resolve many of the structures of interest within these protostars and newly forming planets such as accretion (inflow), jets (outflow along poles), and stellar disks, some of which may have clearings indicative of the planet formation process in progress. The angular resolution of the Magdalena Ridge Observatory Interferometer (MROI) is an important factor in determining what other celestial objects are observable. Because of the wide range of baselines, MROI will be able to resolve objects in the sky that have an angular size within the range of 0.3–30 milliarcseconds (mas) (a milliarcsecond is the approximate height of a man standing on the surface of the Moon, as seen from Earth). This high resolution will allow the MROI to resolve closely separated binary stars such as cataclysmic variables (CVs), and some of the inner structures around black holes in external galaxies (what astronomers refer to as AGN – Active Galactic Nuclei). In a CV, the primary component is typically a white dwarf star (a star at the last stages of its life). The secondary star is a large evolved star, such as a red giant. 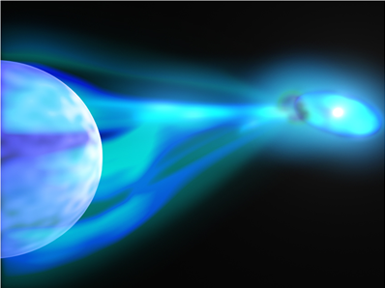 During the orbital revolutions of the pair of stars, gas and dust are gravitationally destabilized and flow from the massive star onto the denser white dwarf companion. This leads to run-away burning on the white dwarf’s surface, producing intense bursts of energy which cause the CV to vary in intensity. This variation is what astronomers typically observe if they do not have a high enough resolution instrument. Resolving both components and the hot dust disk of a CV with the MROI would help reveal the detailed physics and dynamics of such a system. AGNs are the hearts of external galaxies – in other words massive black holes and their immediate environments. They are physically complex objects and the current theory of their structure is still fueled by scientific debate. 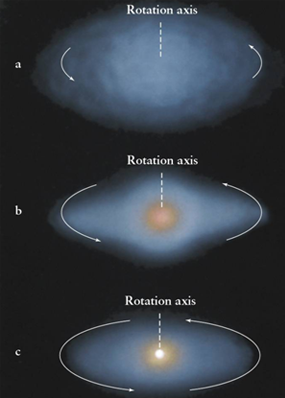 Observationally resolving various components, such as the broad emission line region (BELR) or the dust torus around the AGN, would help theorists refine their theories and add greatly to our understanding of the physics of these systems. The MROI will be able to resolve structures such as the BELR and dust torus and hopefully help clarify questions within the current theory. Artist’s renditions of CVs. Real observations are required to determine which of these is more representative of the physical reality of these systems.